After reading The Hate You Give when it came out I was excited to read what Angie Thomas was working on next. Although I enjoyed THUG, I didn't love it as much as everyone else but still thought that her writing and characters were great to continue reading her work. This leads me to be less than surprised when I fell in love with On The Come Up, it was also great to read with Alex and Rachel to see where our views differed. From the moment I started On The Come Up I knew I was going to love it, I was pulled into Bri's world and didn't want to leave, it is probably one of the only books I liked being over 400 pages. From the start, we get the sense that Bri's home life is not the best and that her family struggles. This, although is hard to read about, was a part of the book that I liked to read as this idea is not often tackled in YA books. This is something that Angie Thomas does so well, tackling issues that we need to see more of in YA. With this focusing so much on Bri's family life, one of the strongest parts of this book is clearly the family relationship. I loved the relationship between her Mum and brother, this was something that develops throughout the novel and evolves into something that is fleshed out and a notable part of the story. I also loved the relationship with her Aunt Pooh because, although starting off as something small, it becomes something more central to the plot. This relationship also leads to more complex ideas of the book including the inclusion of drugs and the assumptions that black people have to face in daily life. This is something that Angie Thomas does so well in her books, tackling real-life issues that are intertwined with a narrative. I also think that with a character like Bri, who is so complex, handles all that the world throws at her and I loved that. I, also, felt that I connected well with Bri as well, there were so many characteristics and parts of her personality that I did like and kept me invested in the story. Bri also has a strong connection with her friends and I loved this about the story, especially as they had their own stories and paths to follow themselves. The book, obviously, following rapping and Bri on the come up (I had to) on her rise to fame and I loved this part. The way that the lyrics were embedded into the story was great and I loved this. This was definitely the part of the story that turned my head and I knew that I was heavily invested into the story. There is nothing that I really disliked about, On The Come Up, I just loved it. On The Come Up is yet another amazing book by Angie Thomas that demands to be read by all. 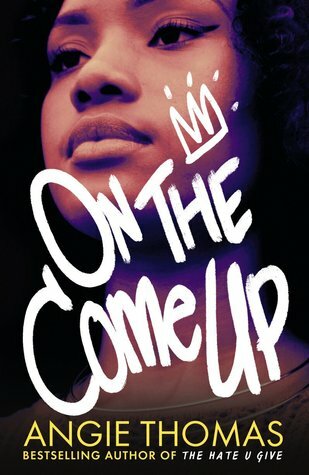 Have you read On The Come Up yet? Do you want to? Let me know in the comments below.